The webinar on Forest Rights and Governance in India will take place on 30 January from 6:00 PM - 7:30 PM IST (1:30-3:00 PM CET or 7:30-9:00 AM EST). 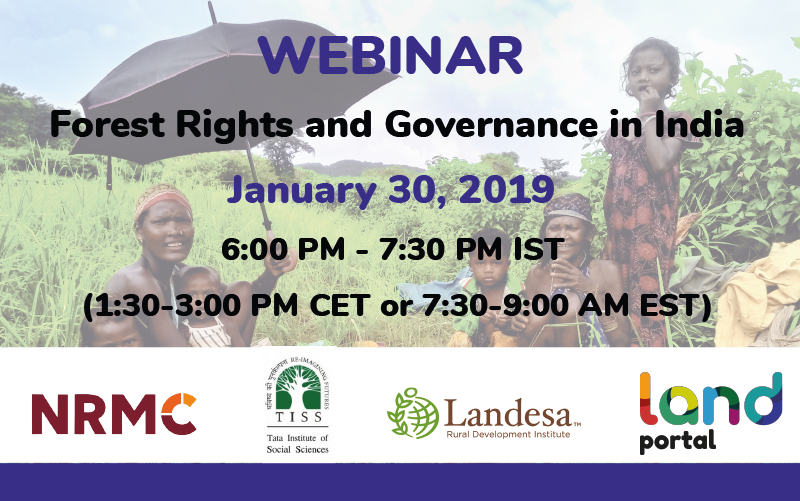 The webinar is co-organized by Tata Institute of Social Sciences (TISS) and Landesa with support from the NRMC Center for Land Governance and the Land Portal Foundation. 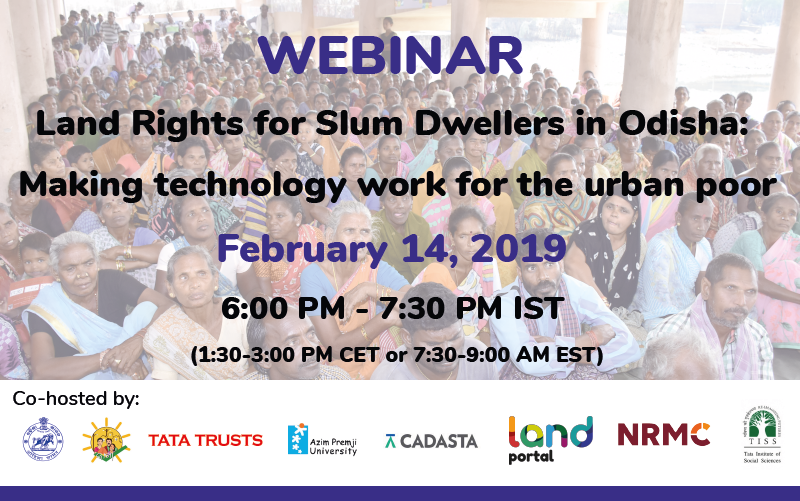 The webinar on Land Rights for Slum Dwellers in the East Indian State Odisha: Making technology work for the urban poor will take place on 14 February from 6:00 PM - 7:30 PM IST (1:30-3:00 PM CET or 7:30-9:00 AM EST). The webinar is co-organized by the Government of Odisha, Tata Trusts, Azim Premji University, Cadasta Foundation, Tata Institute of Social Sciences (TISS) with support from the NRMC Center for Land Governance and the Land Portal Foundation. 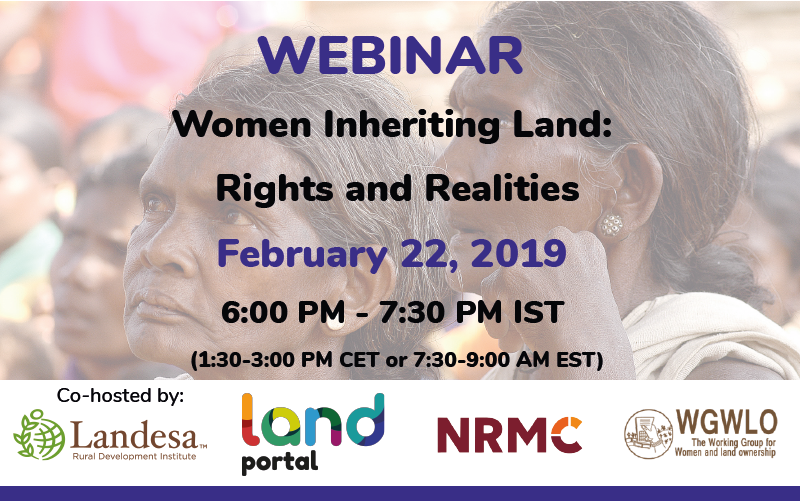 The webinar on Women Inheriting Land: Rights and Realities will take place on 22 February from 6:00 PM - 7:30 PM IST (1:30-3:00 PM CET or 7:30-9:00 AM EST). 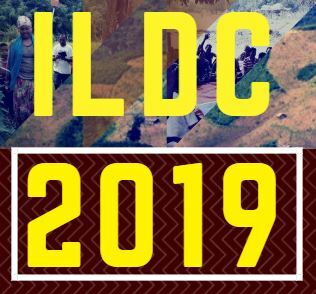 The webinar is co-organized by Landesa and the Working Group for Women and Land Ownership (WGWLO) with support from the NRMC Center for Land Governance and the Land Portal Foundation.